Wow, what a great weekend, starting with a full day at the beach at Rincon on Friday. The air temperature was in the high 70s, the sun was shining, and the water temp was a very comfortable 70 degrees, with just enough waves to make swimming very fun. As we arrived, a couple of dolphins were cruising slowly through the waves about 30 feet from shore. We wasted no time getting in the water, but the dolphins were headed the other direction and we did not get a close encounter. Good friends, a long walk, a picnic, and a session of Smash Ball… can’t ask for more. It was a great day off work, and a wonderful way to recharge. 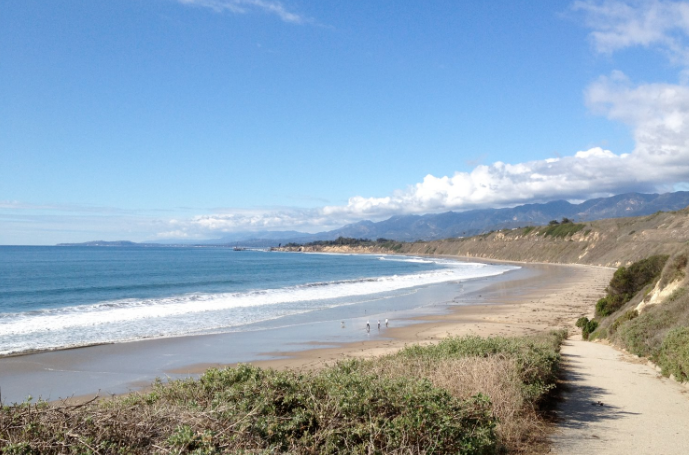 Rincon Beach is just south and east of the beach town of Carpinteria, at the border of Santa Barbara and Ventura counties. What I love about Rincon is its variety. In winter it is the location of the Rincon Classic surf contest, and the point break and cove have been long known as some of the top surf breaks in Southern California. The surf culture here goes from hosting top competitors to the quick getaway by yourself, before work or at sunset, to catch a few sweet waves. Also, in winter it is a great walking beach, since it stretches maybe two miles. In summer, the waves are smaller, and the swim and sunbathing set makes the most of sunny days and this big broad beach. There’s plenty of parking in two lots, and a county park at the top of the bluffs with BBQs and picnic tables. There are crowds in summer near the ramp and stairs down to the sand, but a 10 minute walk up the beach gets you into quiet areas. And if you walk the mile or so toward Carpinteria, there is great birding and often a lot of seals near the rookery (off limits to walking during birthing season in spring). No wonder the Chumash Indians found this sacred ground; it has a magic for sure.